Fresh water is a precious natural resource and may present an urgent environmental concern due to its increasing scarcity. While gardening and lawn care account for a large portion of water consumption, attractive landscaping can easily incorporate water-efficient designs. 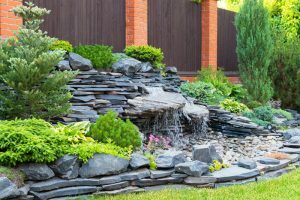 With proper planning, natural landscaping and hardscaping can serve the dual function of conserving water and beautifying an area. Water-efficient landscaping also offers a variety of economic and environmental benefits by reducing maintenance costs and increasing home values. Water-efficient landscaping is engineered to use less water than similar landscaping projects without efficiencies built in. While water-efficiency can be achieved through a variety of methods, selecting plants and landscaping materials specifically designed to improve water absorption is the foundation of any landscaping project. Through native and climate-appropriate planting materials, it’s possible to reduce outdoor water usage by up to 50 percent while creating a greener and more drought-resistant area. While many efficient landscape designs use rocks and plants, such as cacti, that need less moisture, water-smart landscaping doesn’t have to be limited to arid regions. Before placing plants, it’s important to evaluate sun exposure and the type of soil to know how much water will be needed. Using grasses that are tolerant of drought and hardy native species will help to create a natural landscape that will thrive. Placing compost and mulch around plants increases moisture and nutrients in the soil, reducing the frequency of watering. One of the best ways to improve water filtration in your lawn is through aeration, which places small holes in the soil so that water, nutrients, and air can penetrate more easily. Furthermore, selecting a type of grass that is dormant during hot periods and strong enough to withstand a drought can significantly reduce the amount of supplemental water needed. In addition to using natural vegetation in landscaping, man-made features such as paths or walls can also create water efficiency in outdoor spaces. A hardscape can include concrete walkways or walls, stone paths, or even wooden decks. Using more porous materials for hardscaping, such as gravel, brick, or porous pavement, can help to decrease runoff. Water-efficient landscaping and hardscaping work together to bring out the beauty of a space while limiting the need for excess watering or permanent irrigation systems. For more information on landscaping or hardscaping, contact USI online to find a branch near you and get a free quote. USI believes in excellence in every step of the process and ensures timely completion and quality of service, time after time.